Christian Lemmerz (1959) was born in Germany, and lives and works in Denmark. Lemmerz expresses himself in a variety of media; film, performance, drawing, painting and installation works, however is educated in the mastering of sculpture. In his work with traditional materials such as marble, compares him to one of the greatest stonemasons throughout art history.With his marble sculptures, he has inscribed himself in a sculptural practice with origins going back to the well-known masters of antiquity, the renaissance and neo-classicism. In 2009 he was recognized for his work when he was given the Thorvaldsen Medal, the most respected honor any Danish sculptor can receive. Lemmerz art is full of contradictions. He confronts us with the sacred, pathos, illness, death and depravation, but also profanity and elements of kitsch. The focus in his art stretches between, on the one side, the writings of Kant, Heidegger and other philosophers and authors, and on the other, taboo-related themes taken from contemporary or historical events. Lemmerz has pointed out that art has to take effect in the manner of a provocative confrontation. A mass media dominated world where suffering and death, is one of his most central themes in an examination that circles around identity, existence and being. In his exhibition “Hypnosis” at Faurschou Beijing, the skeleton played a leading role. In the exhibition, 128 slowly rotating life-size skulls hung in the air, which had resemblance to astronomical star charts and accompanied by a hypnotic, chanting female voice. Death permitted the entire space, whereas the artist attempted to lead the spectator to see that death is no longer distant, it is the universe. In addition, his choice of conflicting materials may seem provocative, asthe artist explains; his use of fresh blood represents life. He challenges the classical sculptural tradition by using organic and perishable materials such as blood and excrement from animals in combination with lasting and beautiful materials such as plaster, marble and bronze. However, the artistic experience is also attached to the way he produces many of his gravestone-like sculptures in realistic sizes. This establishes a thought-provoking and confrontational situation, especially when perceived from a phenomenological point of view. In a combination with his active use of taboo-related themes, the aesthetic experience of his sculptures can be a visual challenge. Lemmerz creates stimulates, enlightens, and provokes the viewer, so we instead of being distanced onlookers, become active participants in his work. His main point has always been the basic emotional world of human beings, where death, love, faith, freedom, and oppression is at play. 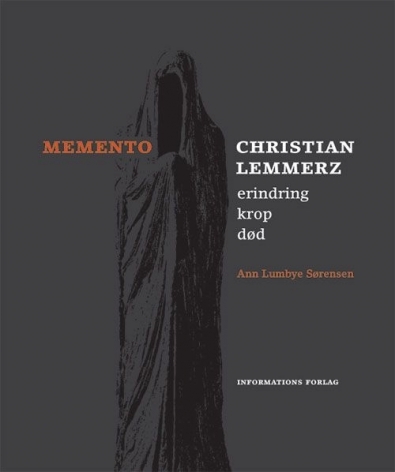 Christian Lemmerz has been represented by Galleri Brandstrup since 2008.